We would just like to remind you that we are offering 15% discount plus 5% Loyalty Points off 10 of our top brands (Vichy, Avene, Nuxe, La Roche Posay, Dermalogica, Caudalie, Klorane, ArtDeco and Klorane). Our website started in 1993, and still no other site offers our level of service! All orders dispatched same day. Presents for Men: SAVE £100 with Our Biggest Discount of the Week! We have a fantastic offer this week with a massive £100 off! HMS Victory Model Ship Kit (was £299.99) NOW £199.95! Make your very own magnificent double-planked, laser cut 1:75 scale replica which will measure 52¾” when assembled. The HMS Victory model ship kit will give you and your family hours of painstaking pleasure. 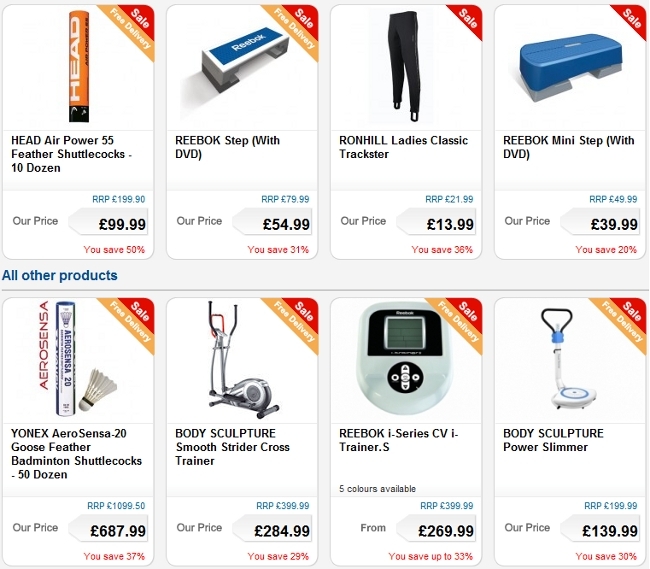 Save up to a massive 80% off our health, beauty and fitness items from our Clearance. No more VPL or bulging bits when you wear an all-in-one Slim Suit. Ideal to wear under soft, flowing and slinky dresses or trousers, these remarkable fitted support garments shape and flatten the tummy, thighs and bottom, leaving a smooth silhouette. This highly portable Exercise Wheel is easy to use at home or when away. Feel the burn as you roll in and out, providing an effective workout which will tone abs, arms, shoulders and back. Fitness guide included. The 38 Bach Flower essences are natural remedies found to have the power to rebalance our emotional states using only the best natural and organic ingredients. These treating fragrance create a soothing mist. With the Olympics just around the corner, customers can head over to online sports retailer ActivInstinct (program 2485) to save up to 80% on a huge range of sports clothing, equipment and footwear including the official ADIDAS Team GB clothing range! PLUS: Throughout July and August, ActivInstinct are giving affiliates the chance to win prizes in their Summer prize draw incentive - any publisher actively generating sales will be entered into the giveaway to win one of three pairs of trainers worth a total of £225. If you have any questions please get in touch with program manager Karen Clayton – karen [at] azam.net! ActivInstinct Sports Sale NOW ON - Up to 80% off Clothing, Footwear and Equipment! The Summer Sale is now on at ActivInstinct (program 2485), one of the largest direct online sports equipment suppliers. Customers can save up to 80% off a huge range of sports clothing, equipment and footwear including top brands such as Nike, adidas, Merrell and Asics. GAME. SET. MATCH. Champion spa & wellness savings! Championship savings to ensure you enjoy a summer of spa & wellness! Save £5 when you buy a SpaFinder Gift Voucher for £50 or more! Choose to burn up the court, rather than a whole in your wallet. Make like the pros with a sports massage, a heart pumping fitness class, a muscle soothing yoga workout, a personal training session or other wellness experience of your choice. Why wait? You can print or email a SpaFinder eGift Voucher for immediate delivery. No postage costs or delivery worries equals a stress-free day at the spa or fitness club. Offer: Save £5 when you buy a SpaFinder Gift Voucher for £50 or more! If you require any further information on this promotion please get in touch. TERMS & CONDITIONS: Terms and conditions are applied to all gift vouchers/gift cards. Code "LOVE50" ends 8 July, 11:59PM GMT. Promotions cannot be combined. CREATIVE: If you would like supporting creative for this offer please email charlotte@spafindereurope.com with your size requirements. There's up to 70% off a wide range of sportswear and sports equipment in the ActivInstinct Summer Clearance Sale (program 2485) with great savings on top brands including Puma, Nike, Reebok, Salomon, Head, Adidas, Asics, Ronhill, New Balance and Merrell. Customers benefit from Free UK Delivery on orders over £50 and affiliates earn 7% commission per sale! May Madness Spa & Wellness Sale Ends Soon! May is almost over, but there is plenty more spa fun to be had with a SpaFinder Gift Voucher this summer. We are giving away a FREE £10 gift voucher with all orders over £70! Whether you are treating yourself or someone special, this little extra will ensure a blissful wellness experience. Visit over 7,000 spas, beauty salons, yoga, Pilates and fitness studios worldwide. FREE £10 eVoucher with all orders over £70! OFFER: Spend over £70 on SpaFinder Gift Vouchers during May & we will send you a FREE £10 eVoucher! TERMS & CONDITIONS: FREE £10 eVoucher will be sent via email within 7 business days to purchaser's email address. Offer cannot be combined with any other promotion or promo code. Offer valid until May 31, 2012. Kinetica have lauched a fantastic new offer on all ready to drink protein shakes. The offer allows customers to buy one pack of 12 drinks and get another pack free, on top of that they come in 3 fantastic flavours. This is an offer we know our customers will love and to help you we have provided some links below. If you have any questions about the programme, please do not hesitate to contact us on the email address below. We'd like to take this opportunity to provide you with a bit more information about the Kinetica Sports brand and the programme. Kinetica Sports develop all of our products in our purpose-built Centre of Excellence for Nutrition. Here we carry out scientific research, product development and analytical work to develop some of the most effective and best tasting sports nutrition products around. Our expertise in whey protein, sensory science and flavour chemistry, along with the trained panellists who taste each product we want to introduce to our range, guarantees that only great-tasting products make it outside our doors. At Kinetica, we’re devoted to developing and designing the most innovative new products. By continuously revising our product range, we can use the best new ideas, technologies and ingredients to improve our products and guarantee customers the best results. Our success is down to a diverse team of people with a wealth of knowledge about every aspect of the sports nutrition industry. SpaFinder 20% Saving on Easter Spa & Wellness Experiences! Buy three SpaFinder Gift Vouchers worth £25 and pay just £60. SpaFinder is all things wellbeing, spa & beauty. We help millions of people find their ideal spa & wellness experience. OFFER: BUY THREE £25 VOUCHERS FOR ONLY £60. ActivInstinct Spring Deals - Up to 80% Off Sportswear! Sports equipment and clothing retailer ActivInstinct (program 2485) have a new set of banners to help you promote their latest product offers and special deals - Pick them up today to help boost your commissions this Spring! With huge discounts of up to 80% off a wide range of top brand sports clothing and equipment, it's the perfect opportunity to give the program a push. There are also some big savings on fitness equipment and sports nutrition, including the latest Spring footwear ranges from Skechers and Nike. There's Free UK Delivery on orders over £50 and affiliates earn a generous 7% commission on all sales! The Perfect Valentine's Gift - the Gift of Wellbeing, Spa & Beauty! The Perfect Valentine's Gift this year is a SpaFinder Gift Voucher. Your customers can relax knowing there's plenty of time to send the Valentine's gift their sweetheart desires - the gift of wellbeing, spa & beauty. Just select the voucher amount, write a personal greeting and we'll provide a FREE SpaFinder Gift Envelope & Standard Delivery! The promo code is HEARTS. SpaFinder Gift Vouchers are welcomed at over 600 locations in the UK and almost 7,000 worldwide for fabulous massages, facials, yoga, Pilates and many other health & fitness experiences. Easy to send and perfect for your Valentine. Offer: FREE gift envelope & FREE Standard Delivery on all post orders with promo code HEARTS starting January 24th until Feb 14th. We've got a great range of healthcare offers to help you stay of track with your resolutions this year. Shop our save up to 1/2 price offer across selected weight management products, ranging from Rosemary Conley meals to SlimFast drums. If you're looking to quit smoking, then we've got a better than 1/2 price offer on selected nicotine replacement products. We also have some great savings across our baby range. We're offering save up to 1/2 price on selected baby products, so it's the perfect opportunity to stock up on all those baby basics for your little one. Including nappies and wipes to toiletries and baby food. ActivInstinct Sale - Massive Savings on Sportswear and Sports Equipment! With huge discounts on an extenstive range branded sportswear, equipment, football shirts, team kits and outdoor gear, there are some amazing savings up for grabs. Early bird Christmas saving - Save 5% plus FREE delivery! Due to the overwhelming success of our Earlybird promotion, we are extending the offer through December! Get 5% OFF ALL SpaFinder gift vouchers, plus receive FREE standard delivery on SpaFinder classic postal vouchers! Until December 20th, select a classic spa voucher and enter the discount code 'EARLYBIRD' to get your exclusive discount and free delivery. SpaFinder gift vouchers can be used at over 600+ spas, wellness and fitness centres in the UK and over 6,000 around the world, each accepting our vouchers for a variety of treatments from massages to manicures. Our vouchers are the most flexible spa & wellness vouchers on the market so treat yourself in the run up to Christmas! If you require any further information on this promotion please do not hesitate to contact us for any further details.